I’ve written this article in today’s Sunday Express about the extraordinary decision by Seb Coe’s Locog to allow Dow Chemical to sponsor part of the 2012 stadium. Dow will be paying for a £7million “wrap” (that’s a sort of colourful curtain wrapped around the outside of the stadium to make it more attractive). Dow’s name will be emblazoned on it in the months leading up to the Games next year. Dow Chemical bought Union Carbide Corporation in 2001. Union Carbide of course owned and ran the chemical plant in Bhopal where a leak in 1984 killed up to 25,000 people. I spoke to victims’ groups in Bhopal on Friday. They are appalled. They protest regularly against Dow for its refusal to help remediate the still contaminated site and where babies continue to be born maimed. Dow refuse all liability saying they didn’t run the plant in 1984 and that settlement was already reached in 1989. The victims’ groups are to complain to the Indian PM; they want him to write to David Cameron. (Sports Minister Hugh Robertson welcomed the decision saying he was “delighted”!) I wonder what possessed usually sure-footed Coe to make such a gaffe as he entered the home straight. I also wonder whether a large campaign will start to get him to reverse this decision. Do Londoner really want this — all for the sake of £7million. 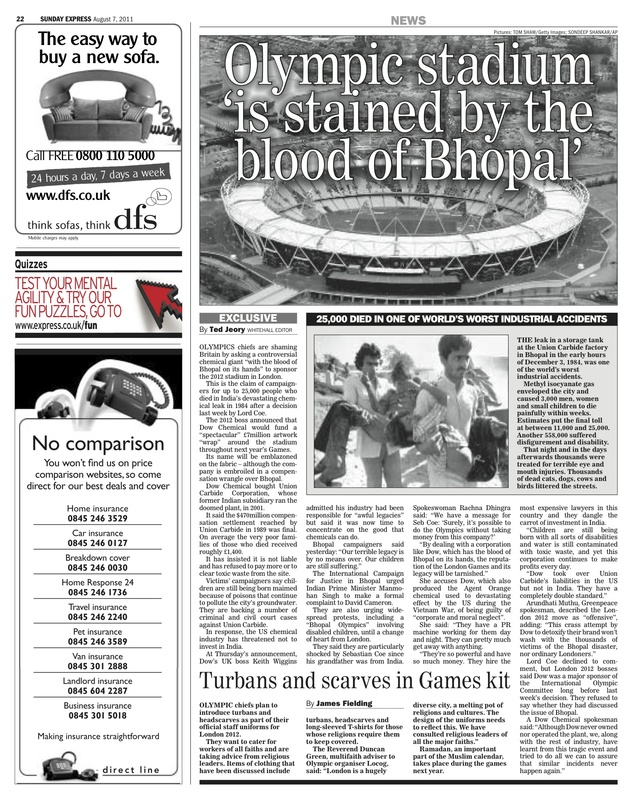 Seems ripe for one of those new Government e-petitions…..
OLYMPICS chiefs are shaming Britain by asking a controversial chemical giant “with the blood of Bhopal on its hands” to sponsor the 2012 stadium in London. This is the claim of campaigners for up to 25,000 people who died in India’s devastating chemical leak in 1984 after a decision last week by Lord Coe. The 2012 boss announced that Dow Chemical would fund a “spectacular” £7million artwork “wrap” around the stadium throughout next year’s Games. Its name will be emblazoned on the fabric – although the company is embroiled in a compensation wrangle over Bhopal. Dow Chemical bought Union Carbide Corporation, whose former Indian subsidiary ran the doomed plant, in 2001. It said the $470million compensation settlement reached by Union Carbide in 1989 was final. On average the very poor families of those who died received roughly £1,400. It has insisted it is not liable and has refused to pay more or to clear toxic waste from the site. Victims’ campaigners say children are still being born maimed because of poisons that continue to pollute the city’s groundwater. They are backing a number of criminal and civil court cases against Union Carbide. In response, the US chemical industry has threatened not to invest in India. At Thursday’s announcement, Dow’s UK boss Keith Wiggins admitted his industry had been responsible for “awful legacies” but said it was now time to concentrate on the good that chemicals can do. The International Campaign for Justice in Bhopal urged Indian Prime Minister Manmohan Singh to make a formal complaint to David Cameron. They are also urging widespread protests, including a “Bhopal Olympics” involving disabled children, until a change of heart from London. She accuses Dow, which also produced the Agent Orange chemical used to devastating effect by the US during the Vietnam War, of being guilty of “corporate and moral neglect”. She said: “They have a PR machine working for them day and night. They can pretty much get away with anything. “They’re so powerful and have so much money. They hire the most expensive lawyers in this country and they dangle the carrot of investment in India. “Children are still being born with all sorts of disabilities and water is still contaminated with toxic waste, and yet this corporation continues to make profits every day. Lord Coe declined to comment, but London 2012 bosses said Dow was a major sponsor of the International Olympic Committee long before last week’s decision. They refused to say whether they had discussed the issue of Bhopal. Corruption, Corruption, and even more corruption. Is it now polluting the UK Olympics? this is an excellent piece. I’m very glad to see the tone that the Express has used and yes I think it is clear that LOCOG, and Lord Coe, really do have the blood of Bhopal on their hands now. The real issue here is that despite Dow’s protestations that- “$470million compensation settlement reached by Union Carbide in 1989 was final.”- this compensation payout is a complete red herring. The current disaster in Bhopal sees tens of thousands of people being poisoned by Union Carbide’s (owned by Dow don’t forget) toxic chemical waste thanks to the contamination of their ground water supply. But, crucially, this HAS NOTHING TO DO WITH THE 1984 GAS DISASTER. The contaminated land, and water, of Bhopal is caused by the indiscriminate dumping of toxic waste, in side and outside of the factory, by Union Carbide while their factory was in production. Even the US courts recognise this as a separate disaster (it, in fact, pre-dates the gas disaster) yet Dow Chemical refuse to accept responsibility for Union Carbide’s poison. This is despite the fact that the ‘polluter pays principle’, enshrined in the law of both the US and India, sees them liable. It is also despite the fact that Dow have accepted liability for Union Carbide’s poisons… in the US! was suprised about 10 years ago at my university where they were still buying stuff from these people. this isnt an ethical olympics. this is a gimmick olympics.